Stairway to Heaven in Paraiso! 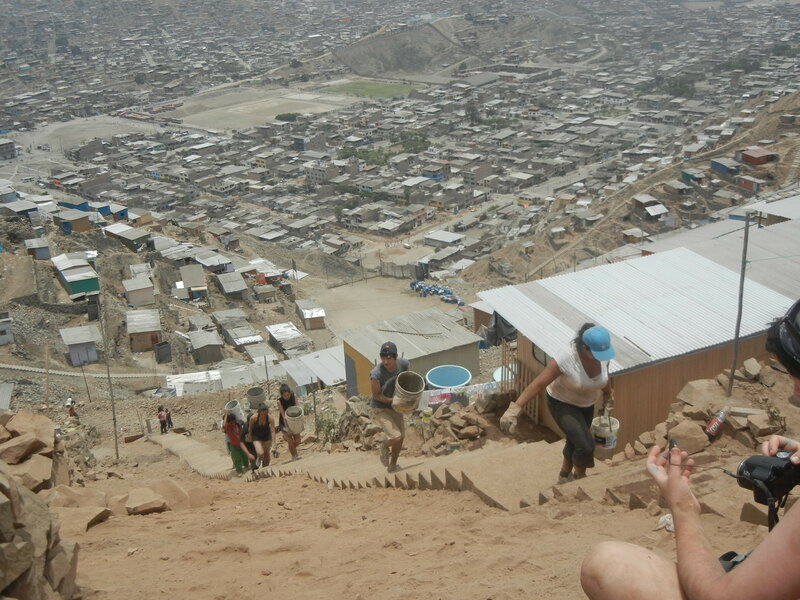 Today is day three of our brigade in Peru and unfortunately, we’re now at the halfway point. Our two brigades went to Paraiso again today. Due to the fact that the shacks cover the entire mountain we went twice so that we can offer services to as many people as possible. The first day of our mobile clinic we were more towards the bottom of the mountain but that area is inaccessible to many families living at the top who can’t make the the journey down often. Hundreds of patients were seen and treated and it was apparent that, again, the clinic was a huge success for this new community. Volunteers, as always, learned a lot and loved playing with the children. Big progress was made for the stair project today. Here is Rebecca Jones‘ and Heather Johnson‘s take on this part of the day. “Today the stairs were finished! 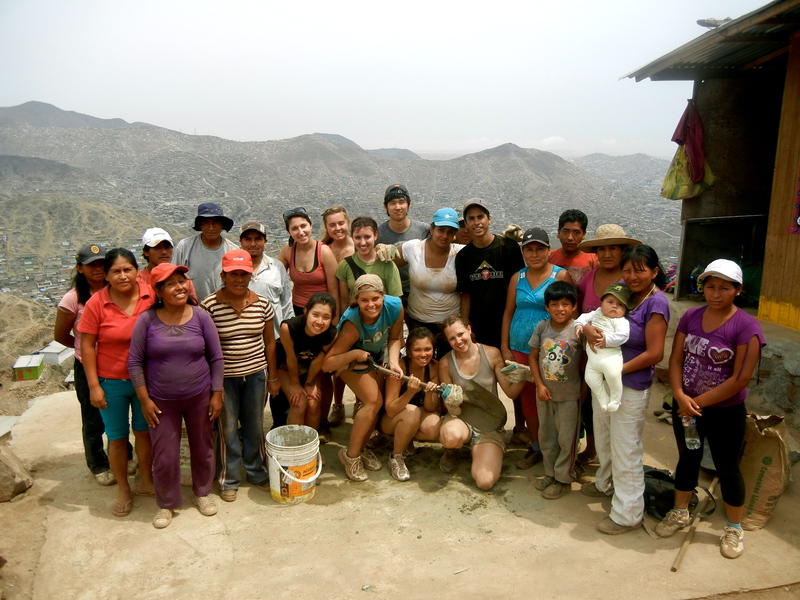 On the third day of the stair project for this small, 15 family community we cemented approximately 400 stairs. Ten of us left the hostel this morning to go to Pamplona Mita. We were all very excited as this was a day we had all been really looking forward to taking part in. When we arrived in the neighbourhood we took in the vast array of the wooden and tin roof homes that seemed to have no end. It was, in a way, very beautiful, each shack has its own unique character expressed in different colours set against the brown clay background. The roads through the shacks can only be described as a one-way street on the brink of a cliff. Despite our incredibly talented driver not a single one of us dared to move in the van for fear of inducing a drop-off. As we rocked back and forth the distinct smells carried by the breeze wafted in through our windows that further contributed to the overall experience of these villages. On our journey, we saw many previously built MEDLIFE stairs made obvious by their red paint. We became very excited to see what we were about to contribute to. When the van could go no further we began our trek towards the construction site. Before MEDLIFE had arrived, the community members built the wooden scaffolding in preparation for us. It’s incredible to see how tight-knit of a community this really was as each household had to contribute at least one worker to help with the construction even if it’s not their own house that was benefiting from these stairs in particular. Over the past two days it was very apparent that our friends had also been hard at work as over half of the stairs had already been filled with the rocks and cement. The only way to accomplish a daunting task such as this was by working as a team, side by side in an assembly line, with the buckets of water, sand, and cement passing constantly from hand to hand. We worked smoothly together even though we did not all speak the same language. However, we did spend the majority of our manual labour learning relevant Spanish phrases. By the end of the day we were screaming “uno mas balde por favor!” (one more bucket please) and “oh look at the perro!” (dog) like any true Peruvian. When we were almost at the top of the stairs and we knew exactly “quantos” (how many) buckets of cement we needed, each one that was passed up through the line was accompanied by a triumphant “quatros” or “duos” from every single person there. The excitement reached a peak when we were anticipating the completion of the top stair and finally (finally) getting our lunch as we had been hard at work for six hours. There was a muy grande celebration had by all… mostly us….wanting those sandwiches. There was nothing but very kind and welcoming people in this community. They always made sure we had enough “agua” even though they may not have had much to give. When one member of our group felt faint it wasn’t long after that a bottle of Inca Cola was provided. (This local delicacy is a shocking neon yellow pop which tastes of bubblegum.) At the end of the day we all stood on the ledge at the top of the stair case and just took a moment to look down at what had been accomplished over the past few days. It was a really touching moment just taking in the view of these communities in the hills and the small contribution we were able to make. First Impressions in Pachacutec, Peru.